3 bedrooms and lots of room to enjoy , central heating and double glazing also. Our Lovely Caravan is your home from home, designed to sleep up to 8 people it has 3 Bedrooms, a Shower Room with 2 separate toilets. A very large living area, dinning area and fully fitted kitchen with everything you could need. It is set on the fabulous Lower Hyde holiday park which has an outdoor swimming pool, indoor splash pool, bar, restaurant, entertainment complex, launderette, amusement arcade, convenience store and bike hire. Situated in the heart of Shanklin this is the perfect place to base you Isle of Wight holiday or short break. The Holiday Home is double glazed and centrally heated and has a 28ft x 8ft deck on the side for added space and comfort, this is available all year round so is you perfect base for either a summer or winter break. We are Norman and Lou, we purchased this fantastic 2015 model 8 birth Caravan so we could enjoy some fantastic holidays on the Isle of Wight with our family and grandkids. This is the second caravan we have had on the Island the first one was when our own children were younger, and now they have grown up we are starting the next generation of visits. We have travelled all over the world, but we think the Isle of Wight has something for everyone, we absolutely love it. Its "OUR" Island. 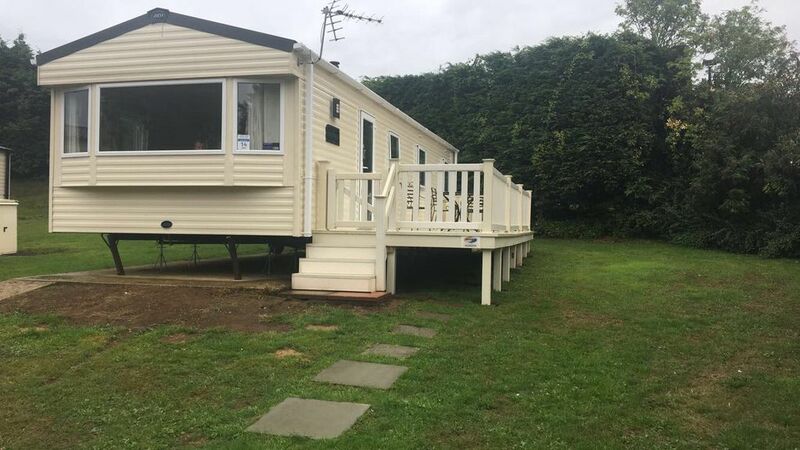 Our caravan is lovely , we specifically bought this one as the living area is large and has lots of space, so even with a big family you are not on top of each other. its a real home from home, in a sunny part of the site and we have also put a 28ft x 8ft deck on the side for extra living space and comfort. We have put some games in the van and the TV is a brand new 32" flat screen with DVD player, and we have even put in lots of DVD's for you to enjoy. It also has two separate toilets for busy mornings, or when you are all rushing to go out. We specifically choose Lower Hyde for our base, because we know the Island so well, we knew Shanklin is one of the most popular parts, as well as being a fantastic base to explore the Island from Lower Hyde is also self contained so you can enjoy the outdoor pool, Bar restaurant and Entertainment complex. (extra charges apply) you can also hire bikes from the entrance of the park, and explore the Red Squirrel route or just go for a pleasant stroll to Wroxhall on the path away from all the traffic. Gas Central heating and double glazing are a real bonus when hiring a caravan in either early or late season, and for the summer months we have the great outside pool, and for chillier times there is the indoor splash pool or the great indoor pool at the sister camp next door. The Entertainment complex is great as well which certainly keeps the kids busy whilst you get time to relax. The living area of the van is really large so the whole family can enjoy time together without getting under each others feet. toilet, shower, Full Shower room with enclosed Shower lavatory and sink. toilet, Toilet and wash basin in this room for that extra facility. Full Gas central heating and Double Glazing with a lovely gas fire in the living area. There is a full service launderette on the site. A gas fire in the living area perfect for those chilly autumn evenings or the cool spring mornings. There is ample free parking around the site. Internet can be purchased for the reception for the duration of you stay. The living area is really good with seating for up to eight people plus the added space of the dinning area and the outside deck are for socialising. A full gas oven and hob, makes cooking the Sunday roast a delight. Of course a microwave, new in 2018. Enough and more for up to eight people. A lovely full sized kitchen, with all the facilities you could wish for on your holiday with enough crockery and cutlery for up to eight people. Dinning area attached to the living space , separate but together at the same time. There is a brand new (2018) TV with integrated DVD player with lots of DVD's provided for your enjoyment. This is integrated into the TV with lots of DVD's Provided for or enjoyment. A full amusement arcade in the entertainment complex for you pleasure. A selection of games for your enjoyment. DVD library for your own use. Kayak and Canoe hire is available from the beach only a short drive or walk away. Bike hire is available for the site entrance. We have a fabulous 28ft x 8ft deck area which you can relax on in the summer evenings. Fab with a nice cool drink when the kids have gone to bed. There is a fab outside pool with a great flume for the kids. If it is a little cold of you do not want to be outside there is a great indoor pool at the site site 500 meters away you can use. A hot tub is located in the indoor plunge pool area. Shanklin is one of the most popular ares of The Isle of wight and close to all the fantastic things there is to do on the Island. Once you have visited the Isle of wight you will always want to return, it is a hidden gem and one of the most beautiful place to visit.